Our Plantation is situated in Roszyce, a village around 10 km from the Baltic Sea shore. As the Influence of the sea moderates the climate, our trees have optimal growth conditions. 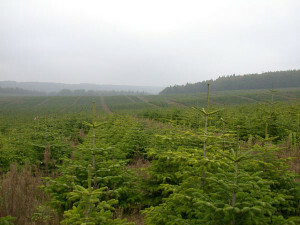 The plantation was set up in 1995 on the area of 70 ha. Currently, the wooded area extends 240 ha. All our seedlings come from best Danish nurseries. They have been delivered to us in special paper bags, that secure proper conditions of storage during the transport. Using machines to plant our seedlings, we manage to keep regular spaces between the plants, which is also favourable to the development of the trees.